We were a bunch of sickies this week…which, on one hand I hate being sick…but on the other hand we stayed home and did nothing…and it was glorious. I broke open two charm packs from Robert Kaufman of Doe. One charm pack is the Doe coordinating solids…not colors I would ever put together on my own and that’s why I love Carolyn’s fabric so much. Last weekend before my sweet lovely children gave me a cold I snuck out to my favorite local shop and picked up a few fabrics I didn’t need had to have. I love to be sequestered in my house. 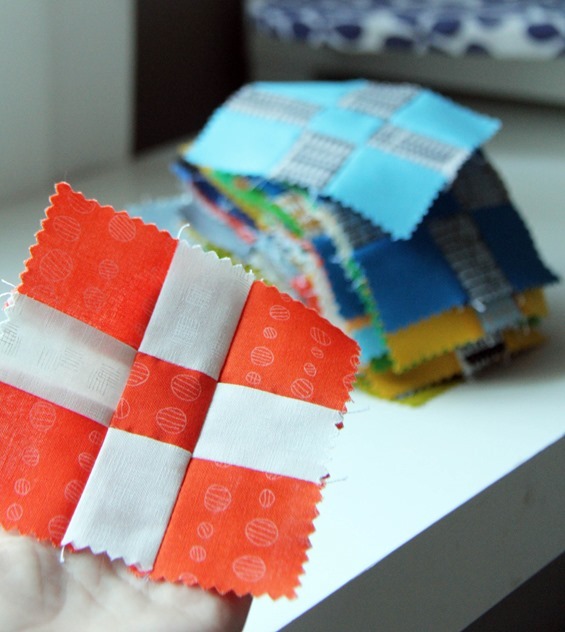 I love whatever pattern that is that you used for your charm squares … any details available that you can share? :) Thanks! I'm with Jen, I would love to know how you did that with your charm squares. Card to share? That is why I hope we have a cold, wet winter full of icy streets! Then I HAVE to stay home….darn! :) Love that pattern and the colors in Doe. And I'd love to know what a few of the prints are that you bought. The crosses and the green with black circles/blue squares are really enticing! So sorry about the sickness, but what a good time of sewing. Staying home does have it's perks. Keep laughing and laughing. love it. The buying fabric thing is a little bit ridiculous with me! I constantly tell myself that I won't buy anymore fabric, only to immediately turn around and do just that. There are too many temptations! I get emails constantly, with irresistible offers from all kinds of unique and wonderful web stores, catalogs in the mail, and then how can I not visit my favorite LQS which is almost 375 miles away, when I happen to be in town? That sounds like the best sort of cure for a cold – I hope it did the trick and you're feeling better soon! 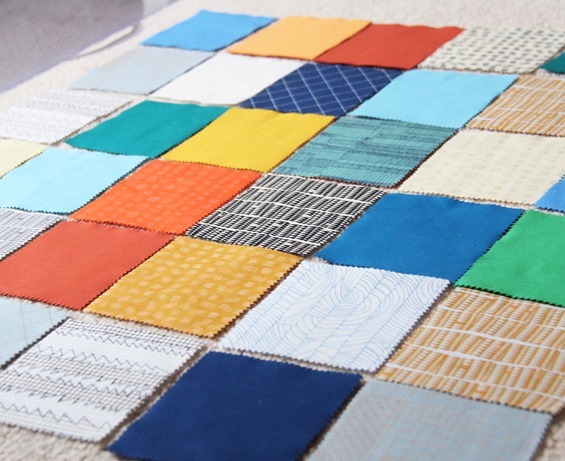 I love the colours in the new quilt too – gorgeous shades and just slightly muted make you want to wrap up in them! Sorry to hear you are sick. Sure nuff on Tuesday, I come down with the sniffles after Sunday church and nursery time. The Pitts being sick. Love the poster you placed. True so true :). Love your little quote at the end – I had to pin it. So True!! Hope you are all feeling better again! I havee that same quote pinned, makes me laugh every time I read it. Must be a fabric bug in the air too…I had to run to my fave little local shop and buy a few things! She's in the old bakery in Belle Fourche SD and called The Bakery Fabrics…so cute and she has the so much fun stuff. She is online too. Anywho! I got hung up on gray!, something I would never buy either and after pinning several scrappy quilts with gray back ground I'm hooked! I really like the "doe" color too! Cute blocks btw! Is that the disappearing 9 patch? So hope you and the kiddo's are feeling better. That is kind of like secretly being excited about being snowed in ( love being snowed in!) I can hardly get downstairs fast enough and warm up by the sewing machine. haha! :) Oh and the football quilt is coming along great! Enjoying the process very much! Cute! Doe is so pretty ~ looking forward to seeing this fun quilt! 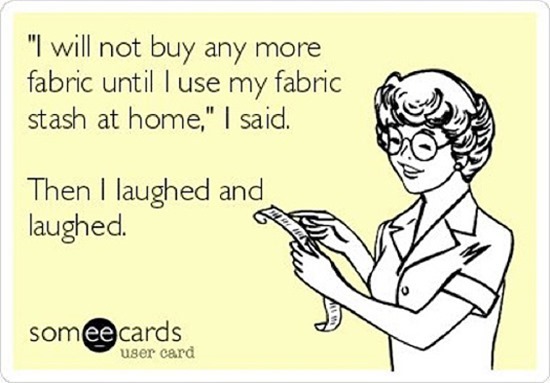 I so identify with that little cartoon at the end ~ I can go months without buying fabric and then I'm totally out of control! I don't think I'll NEED to buy any fabric ever ~ I can't help myself tho! 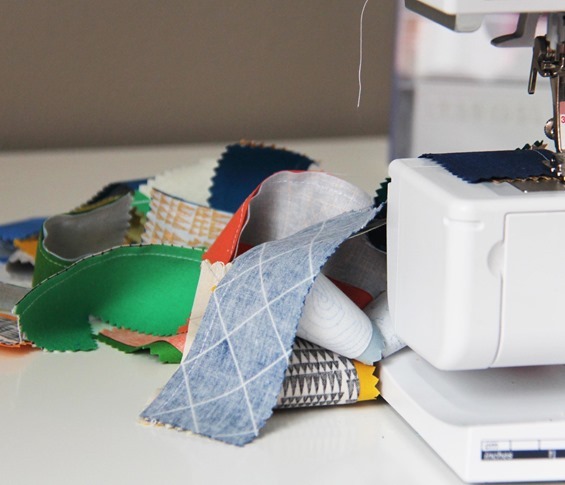 Your pieced blocks are so crisp! Do you use Best Press or other starch alternative when you iron? Sorry you are sick. That Doe fabric is on my list of things I must have. Hmmm the same cold is making it's rounds through my house too. I've only been out once this week and that's because we needed food! 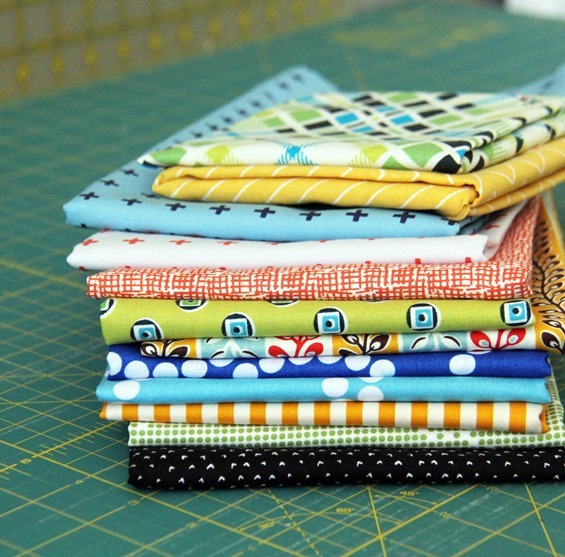 I love those colors in your newest quilt and had no idea that there were coordinating solids. It makes me love doe even more! I resemble that someecard… hope you are all well soon! Gorgeous and I love the colors! Hope everyone feels better soon! 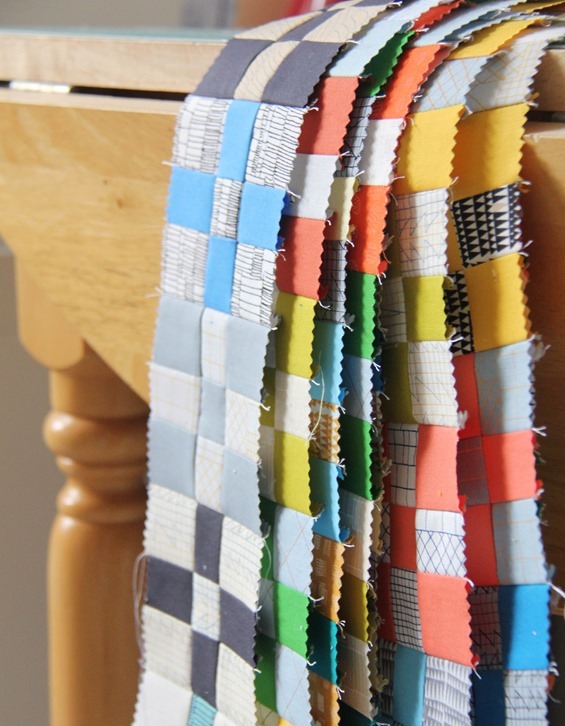 As always – love your quilts and fabrics. The Scrap book looks great and we all have tons of scraps! You inspire us with your creativity! Hope the family is on the mend and Happy Thanksgiving! I always feel a little bit of joy when we're sick. I love an excuse to go no where for a week! Glad there was some colour in yours! See, you take a collection I can't say I was wild about and you make it look ace! Looking forward to seeing your finished quilt.